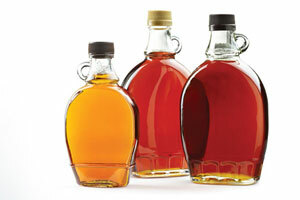 Maple syrup grades are based on clarity and flavour characteristics. 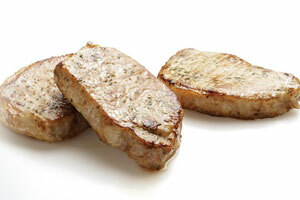 Depending on where it is produced, either federal or provincial grade standards may be used. Federal grade standards are Canada Grade A and Canada Processing Grade. Ontario grade standards are Ontario Grade A and Ontario Processing Grade. All maple syrup is colour classified as Golden, Amber, Dark, or Very Dark. 1 tbsp (15 mL) contains 40 calories, mainly sucrose. The Algonquin Indians and other tribes were tapping maples (and other trees, too) for sap long before the Europeans came to North America. The natives used it to flavour boiled meats and porridge, and as part of a health tonic. While the early settlers learned to make maple syrup, it wasn't until the 19th century, when metal containers were used to catch and boil the sap, that it became a significant industry. And to celebrate its arrival, many communities across Ontario hold maple syrup festivals each spring. To ensure you are getting real maple syrup and not an imitation breakfast syrup, check the label for "Maple Syrup" or "Pure Maple Syrup" and the name of an Ontario producer or packer. You can freeze maple syrup for up to one year in a tightly-sealed container, but be sure and leave 2 cm of head space for expansion. It will take about one hour at room temperature for the maple syrup to become pourable. Opened containers should be refrigerated. If you see any mould appearing, discard immediately. For most people, maple syrup is reminiscent of pancakes, waffles and French toast. But it has many other uses. It flavours hams, bacon, spare ribs and pot roasts. It can be a dessert flavouring for ice creams, custards, flans, salad dressings, mousses and toast spreads as well as baked goods such as muffins, biscuits, pies, tarts and cookies. A unique southern U.S. dish uses a maple syrup and cream sauce to cover a combination of fried chicken, Virginia ham and waffles. And some people insist only finely grated maple sugar should be added to cinnamon for cinnamon toast.